Tell Kinneret is a high hill on the north-west side of the sea of Galilee, where the biblical city of Kinneret once was located. Today the site is used as the water pumps for the National Carrier project. 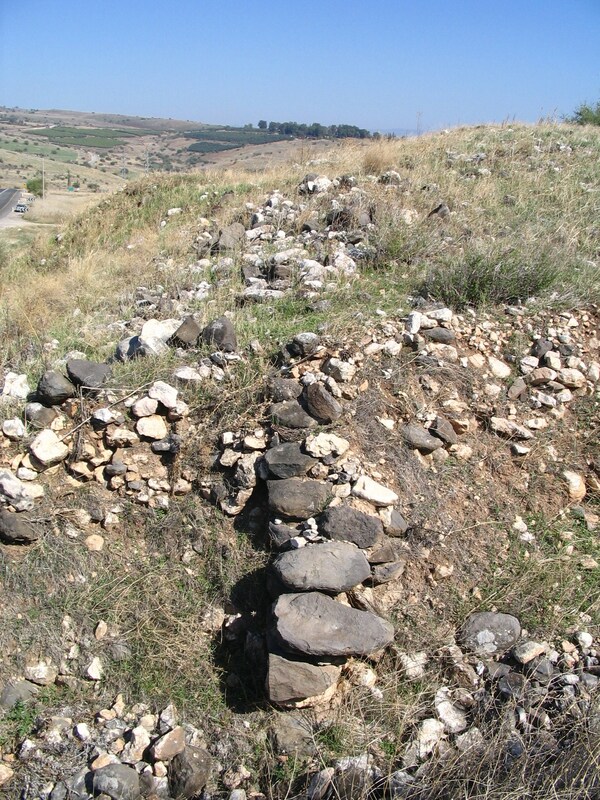 Joshua 19, 36: "...And the fenced cities are Ziddim, Zer, and Hammath, Rakkath, and Chinnereth,"
A steep hill in the north-western corner of the Sea of Galilee. 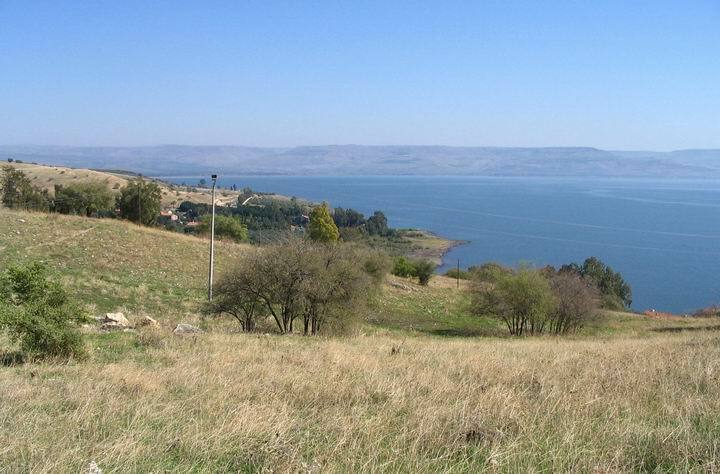 It is identified as the Biblical city of Chinnereth (Kinneret), which is listed by Joshua as one of the fortified cities in the Naftali tribe region. Tell Kinneret is located on the north-west corner of the sea of Galilee, west of Tabcha. It is 75M above the lake and 125M under the Mediterranean sea level. 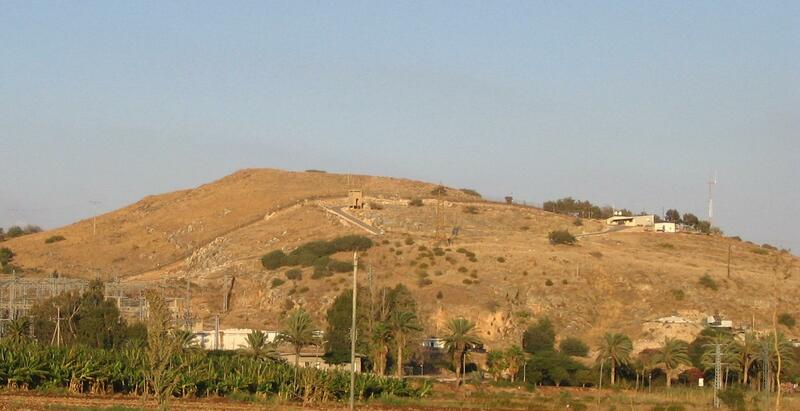 The road from Tiberias to the north and to the east passes through the western side of the hill. The hill is now closed by the National Carrier project, where powerful pumps push water from the sea of Galilee to the center and south of Israel. 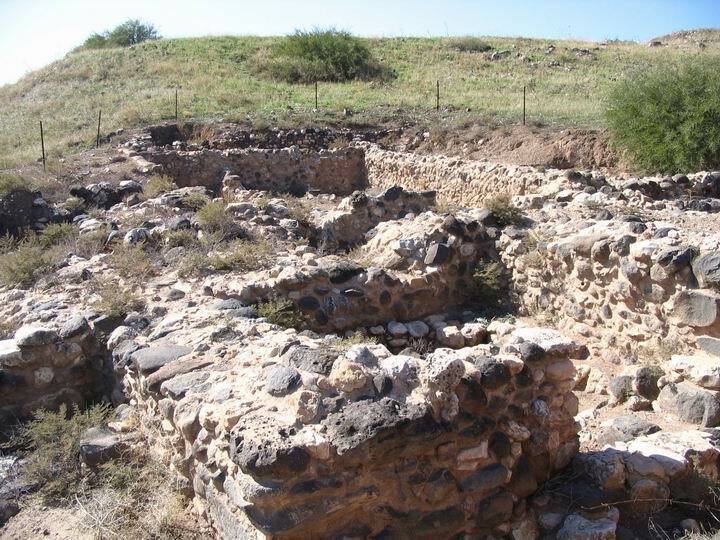 The strategic location of the ancient site, which was a gate on the main road from west to east, made the city an important Bronze age (Canaanite) and Iron age (Israelite) city. This is the aerial view of the area from the south-east side. The site is located on a steep hill on the north-west corner of the Sea of Galilee, and the main road passes on the west and north side of the site. The ruins are located on the top of the hill. In the prehistoric period the area south-east to the Tell, in the edge of the Amud creek, was populated starting in the Early Paleolithic period (150,000 to 80,000BC). Fragments of skeletons were found in the Amira cave and other caves along that creek, about 2KM from the Tell. The Tell was populated starting in the Early Bronze period (3150BC-2200BC). In 1928 a fragment, from a Egyptian basalt tablet, was found on the hill. It is believed to be from the time of Egyptian Pharaoh Thutmose III, whose conquest in 1468BC captured many of the land's cities, including Kinneret which was listed in his 119 captured cities. 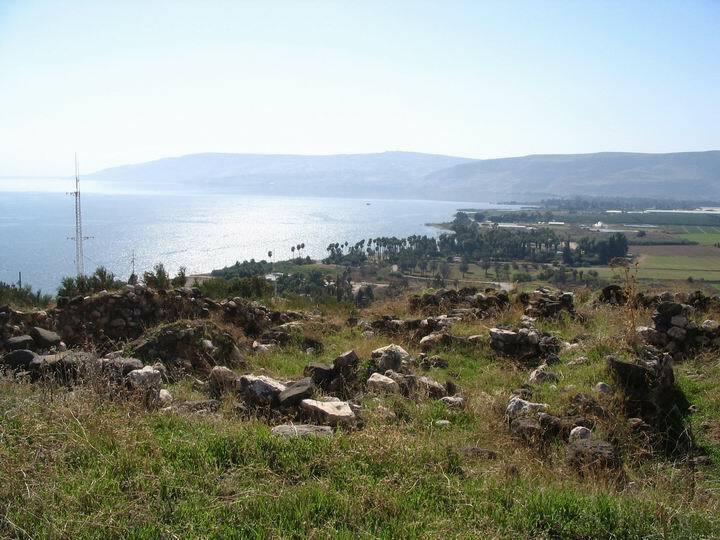 The Tell continued as a city until the Hellenistic period (4Th-1stC BC), and then was relocated to Cappernaum, following a common pattern of relocation from the Biblical Tells to the new and larger villages. At Jesus times, the road from Cappernaum to/from the Galilee and Jerusalem passed at this site, so all his many travels (see the events list of Jesus footsteps) have passed here. Judging from the topography, this was probably at the side of the shore of the lake, through the seven springs (Tabcha) and near Khirbet Minya. 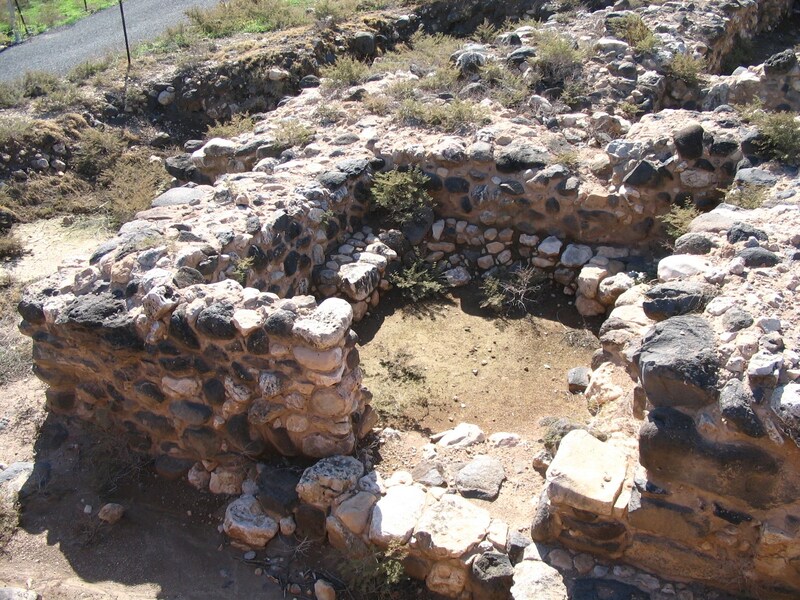 It may have also been the place where he healed many people - Gennesaret (Mk 6:53, Mt 14:34). Modern times: The Tell is in ruins since then. In the 1960s a national water works project was constructed in the south side of the hill as the base of the water pumps, that raised the sweet water up to the plains above the sea of Galilee depression, and then down all the way to the south of Israel. There is no access to the hill, except for the shore line where a youth hostel is located ("Karei Deshe"). This is a view of the Tell from the south. On the Tell are traces of ruins: fragments of Ceramics, and ancient building blocks. The National Carrier water pumps are located in parts of the hill. This is the view from the north, seen from the entrance to mount beatitudes. On the right side is the hill, behind it is the Arbel cliffs, and on the left is Tabcha. When driving northward and after passing the summit, there is an entrance on the right side to the National park of Tell Kinnaroth. You can park the car on the side of the road, and walk up the hill. 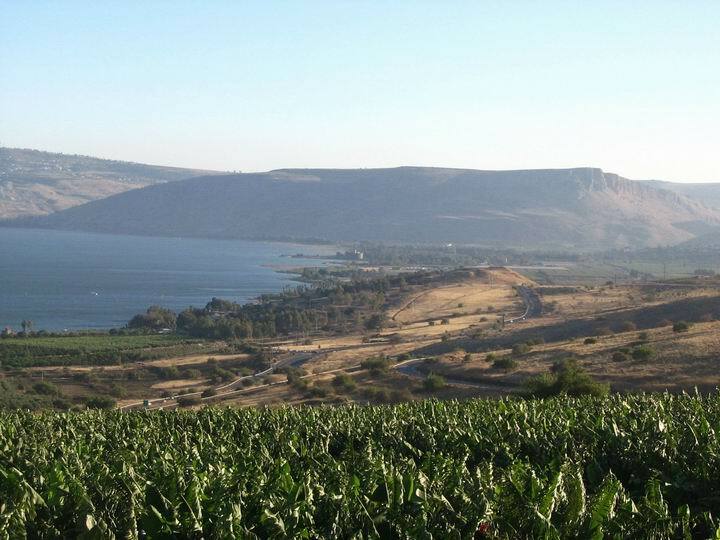 This is the view from the road, looking east into the sea of Galilee. Behind the electric pole, you can see the church of Tabcha and further on site Capernaum. The ancient road passed from there, below the hill (where the roof of the youth hostel is seen on the right side). This road went along the shore to Magdala and Arbel. On the sides of the Tell and on the peak there are large size excavations that revealed the walls and the buildings. 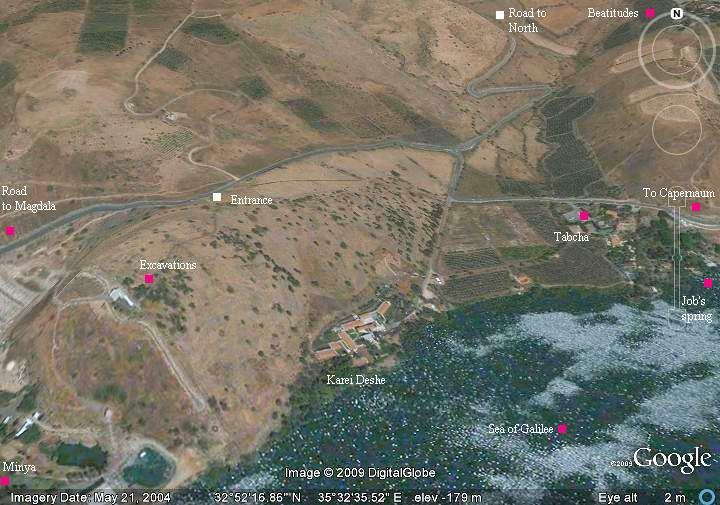 In the photo below you can see parts of the excavated areas, belonging to the bronze age. This photo is on the eastern slope facing the lake. A detail of one of the rooms is seen below. As you can see, these rooms are quite small. From the top of the tell there is a great view of Horvat Minya, the plains of Ginossar, and the Arbel cliffs in the background. This photo is on the western side of the top of the hill, with the city walls. In the background is the church of Mt Beatitudes. This text describes the region of the Naphtali tribe, and the fenced city of Chinnereth was one of its cities. And Adamah, and Ramah, and Hazor,"
And to the kings that were on the north of the mountains, and of the plains south of Chinneroth, and in the valley, and in the borders of Dor on the west,"
This text describes the intrusion of the King of Damascus, Benhadad I, in 885BC, to the area along the north Jordan valley. "So Benhadad hearkened unto king Asa, and sent the captains of the hosts which he had against the cities of Israel, and smote Ijon, and Dan, and Abelbethmaachah, and all Cinneroth, with all the land of Naphtali". In these texts Jesus lands on the shores of the "land of Gennesaret", which is called after Tell Kinneret (the main city at this area) or the valley south to it (along the shore until Magdala). Here he heals many people. "And when they had passed over, they came into the land of Gennesaret, and drew to the shore. And when they were come out of the ship, straightway they knew him, And ran through that whole region round about, and began to carry about in beds those that were sick, where they heard he was. And whithersoever he entered, into villages, or cities, or country, they laid the sick in the streets, and besought him that they might touch if it were but the border of his garment: and as many as touched him were made whole". "Then they that were in the ship came and worshipped him, saying, Of a truth thou art the Son of God. And when they were gone over, they came into the land of Gennesaret. And when the men of that place had knowledge of him, they sent out into all that country round about, and brought unto him all that were diseased; And besought him that they might only touch the hem of his garment: and as many as touched were made perfectly whole". Kinneret - the name in Hebrew for the city and the lake (sea of Galilee). The source of the name is not known, but some options are offered in the sea of Galilee overview page. Kinneroth - plural in Hebrew for Kinneret. In Christian texts the name has transformed to Genesareth.